Today was a banner day for big brother. 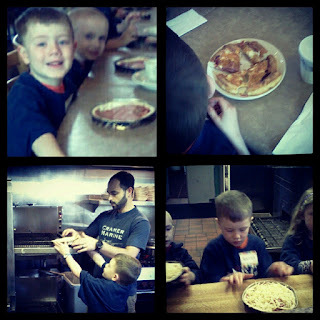 We started the day with his preschool field trip to a local pizza joint. Coolest field trip EVER. They do these at Spartas Pizza all the time and the manager was all bizness. She got the kids situated and basically told us moms to back off and let her run the class. Half the moms went over to Starbucks for a nice unexpected coffee break and the rest of us sat and chatted and took pictures when we could. 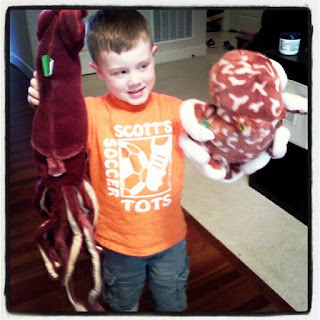 When the kids were done, they had to share with us - WIN. I'd never tried their pizza before and even the kiddo version was pretty darn good - that's about the highest level of praise I can give pizza that's not from Chicago. Anyhoooo, daddy took the day off so that he could watch baby girl while we went off to eat pizza and now he's taking big brother to his weekly soccer class. He's beyond excited to introduce daddy to his coach and show off his skillz. Pizza, squids and soccer: days don't get much better than that for our resident five year old.